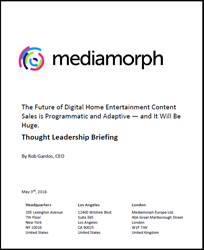 Mediamorph, the award-winning software partner to the largest Media & Entertainment companies, released a white paper entitled, “The Future of Digital Home Entertainment Content Sales is Programmatic and Adaptive — and It Will Be Huge”. White paper abstract: Following the course of Programmatic Advertising, sales of Digital Home Entertainment content will also become programmatic and adaptive. As we have witnessed with the explosive growth of Programmatic Advertising, where 59% of all US digital display advertising ($15.43B) was sold programmatically in 2015, we will witness a similar growth in “Programmatic Content”, where studios will sell, merchandise and price their content to Video Service Providers in an adaptive fashion, thus enabling far greater scale and monetization.